What Are the Uses & Benefits of Forskolin? How Do I Pick a Good Forskolin Product? In order to help you find a good product we’ve researched & narrowed down the best forskolin supplements on the market right now. 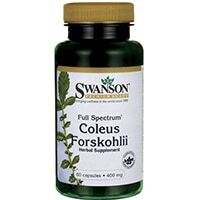 Swanson Full Spectrum Coleus Forskohlii is one of the more powerful forskolin supplements. It is possibly one of the most effective forskolin supplements on the market due to its potency of 400mg per capsule. Swanson has a great reputation and offers this product at a very reasonable price. This forskolin supplement is made by Swanson Health Products, an independently owned company based in Fargo, North Dakota. The company was founded in 1969 with an emphasis on providing high quality supplements at affordable prices.They are renowned for their excellent customer service. This is one of the best rated forskolin supplements because of it potency. If you’re looking for good forskolin pills with strength, look no further. 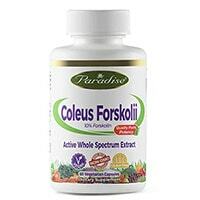 Paradise Herbs Coleus Forskohlii is one of the better forskolin supplements currently on the market. Each serving provides 250mg of 10% pure forskolin extract. Paradise Herbs uses a 100% natural extraction method to ensure the purity of its products. Established in 1994, Paradise Herbs is a family owned company committed to offering organic supplements which retain nature’s natural balance. They place emphasis on quality, safety and customer service. This is one of the top forskolin supplements available today. You can’t beat the price or the reputation of this company. 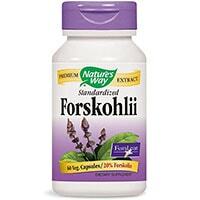 Nature’s Way Forskohlii Extract Standardized supplement provides 125mg of forskolin per serving, standardized to 20% extract. Nature’s Way Forskohlii Extract is manufactured by Nature’s Way, a company which uses TRU-ID™, a cutting-edge DNA testing system designed to ensure the purity of ingredients. All Nature’s Way Herbal Singles are TRU-ID™ validated and non-GMO certified. Nature’s Way is a good company, and this is a good product – but it’s expensive considering the low concentration per serving. 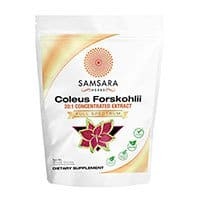 Samsara Herbs Coleus Forskohlii Root Extract Powder is a 2 oz sealed package of forskolin powder at 20% concentration. It can be added to drinks or used to make shakes. This supplement is made by Samsara Herbs, a company which has a product line of nine concentrated supplement powders. This form of forskolin is suitable if you want to make your own drinks or capsules. It’s a bit less convenient than capsule options. 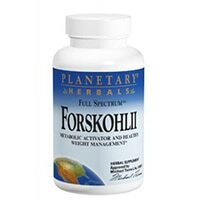 Planetary Herbals Forskohlii Full Spectrum provides 130mg of forskolin. Each bottle contains 120 capsules. The forskolin extract is standardized to 20%. This product is made by Planetary Herbals. There supplement formulas are based on the traditions of Ayurvedic and Traditional Chinese medicinal practices. Their Full Spectrum™ formulas offer unique blends. This is a very expensive supplement, particularly given that the concentration of each capsule is low compared to similar products. This product is made by Nature’s Plus, the manufacturer of more than 1,200 nutritional supplements. All their facilities maintain adherence to cGMP compliance. The company is FDA and NSF registered. This is an expensive forskolin supplement given the low concentration of each capsule. The functions of the patented enzyme activation system are not clear. NutriCargo Coleus Powder is a bulk forskolin powdered extract which contains 2.2 lbs. 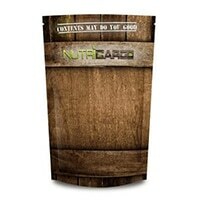 The supplement is made by NutriCargo, LLC., which is a manufacturer of bulk supplements. They offer shipping worldwide. This product is suitable if you’re looking for a bulk supplement with value for money. 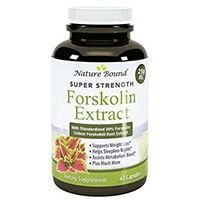 It’s a bit less convenient to use, but it’s a very affordable option if you’re taking forskolin regularly. Bio Sense Natural Coleus Forskolin Extract is an American-made forskolin supplement which provides 250mg of forskolin root extract standardized to 20% purity. This extra strength makes it a powerful supplement. This product is made by Bio Sense Health Products. A company which is dedicated to developing and manufacturing supplements that will work for consumers over the long term. When you want a good product at a good price, this supplement is a sensible choice, particularly if you are looking for forskolin caps that easy to swallow and are absorbed efficiently. 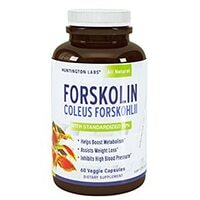 Huntington Labs Coleus Forskohlii is a high-grade forskolin supplement which provides 250mg of Coleus forskohlii extract which is standardized to 20% pure forskolin root extract. Huntington Laboratory Company is based in the U.S. There is not further information available about this company. This supplement is affordable and effective, but it does contain fillers. 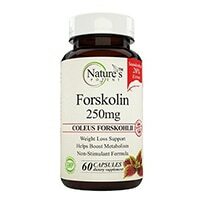 Nature’s Potent Forskolin supplement provides 250mg of forskolin standardized to 20% pure extract. The bottle contains 60 capsules. 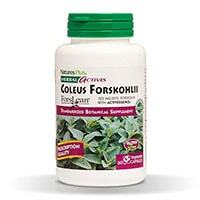 This forskolin supplement is made by Nature’s Potent. They manufacture a wide range of nutritional supplements. They guarantee that all their ingredients are tested before and after they reach their laboratories. This is an expensive supplement and is not suitable for vegans. It also contains fillers. Forskolin is a chemical which is found in the roots of the Indian Coleus plant (Plectranthus barbatus). The plant is a member of the mint family and is native to Nepal and India. The substance has a long history of use in Ayurvedic medicine for respiratory, cardiovascular, gastrointestinal, and central nervous disorders. Forskolin, otherwise known as coleus forskohlii is believed to work by activating the enzyme adenylyl cyclase, which increases levels of cyclic AMP – this helps to control processes involving enzymes in living cells. Increasing cyclic AMP levels is important because it plays a vital role in the communication of cells located within the pituitary glands and the hypothalamus. This in turn boosts hormone feedback control. When cyclic AMP levels are increased, the body produces more hormone-sensitive lipase. This is an enzyme which instructs the body to burn fat. Forskolin is also thought to stimulate the release of thyroid hormones, which also help to burn calories. Weight loss: One of the most widely proclaimed forskolin benefits is its ability to potentially improve weight loss efforts. A study on Forskolin published in the Journal of International Society of Sports Nutrition determined that while Forskolin does not seem to promote weight loss, it may inhibit weight gain. The study involved 23 female participants who supplemented their daily diet with either a Forskolin supplement or a placebo twice each day for a period of 12 weeks. There were no reports of side effects. High blood pressure: Forskolin may help support healthy blood pressure. A study was undertaken on 48 patients with high blood pressure. The subjects were divided into two groups and given different doses of forskolin for a period of two months. The results showed that the more potent dose was able to lower high blood pressure. Heart: A study conducted on rats, published in the Canadian Journal of Cardiology, suggests that forskolin may help to improve cardiovascular functions. More human trial research is needed to confirm this benefit. Glaucoma: This condition causes damage to the eye’s optic nerve and typically worsens over time. A small study revealed that forskolin may help to alleviate pressure in the eyes which is often a result of glaucoma. More research is needed. Asthma: A single study on adults and children, suffering from moderate or persistent asthma, showed that a daily 10mg dose of forskolin reduced the frequency of their asthma attacks. Further research is needed. Blood sugar levels: An animal study, published in the International Journal of Medical Sciences, revealed that regular doses of forskolin given over a period of eight weeks may reduce fasting blood glucose levels. Further research is needed. Alzheimer’s: There are some claims that forskolin may help support Alzheimer’s disease, however studies conducted on Alzheimer’s suffers and postmortem brains did not support this claim. Overall, forskolin certainly has some interesting and promising effects that have been verified by clinical science. With that said, some of the claims manufacturers make about these products are not backed by credible science. More research is needed on this supplement. The recommended forskolin dosage, based on various studies, is 125mg of Coleus Forskohlii standardized to 20% forskolin taken twice daily, or 250mg of Coleus Forskohlii standardized to 10% forskolin taken twice daily. The supplement can be taken with or without meals. It’s best to split up the dosage into two equal amounts throughout the day. Lowering blood pressure: Forskolin is not recommended if you suffer from low blood pressure and you are taking medications such as Beta-Blockers, Clonidine, Hydralazine, or Calcium Channel Blockers. Bleeding: Forskolin may cause bleeding if you have a bleeding disorder or you are taking blood thinners. Surgery: Forskolin is not recommended for at least two weeks if you are about to undergo surgery. Women who are pregnant or breastfeeding should avoid taking a forskolin supplement, as there have not been any reputable studies that looked at forskolin’s effect on pregnant women. There are many brands of Coleus forskohlii supplements out there, and there are a number of factors you should consider when you’re looking for the best quality forskolin pills. You should look for a supplement that has a minimum 10% extract of pure forskolin. The product should be made in the U.S.A and should not contain artificial colors or flavors, preservatives or binders.